What started as a mathematics teacher's traveling tales has turned into an empire of destination-hopping young travelers taking the world and Turkey's hippest cities by storm. With two new branches in Istanbul and a second in İzmir, Varuna Gezgin now operates the most popular and certainly most colorful venues in these cities in addition to its flagship in Eskişehir and two more cafes in Ankara. What makes these fun, happening cafes so special is that all of the staff running this well-oiled traveling machine are all backpackers or soon-to-be-exotic country travelers, as Varuna Gezgin holds monthly tours in destinations all over the world for their employees. I recently had the chance to meet with Murat Fıçıcı, the man who created this wide network of world travelers in their newest venue in İzmir, an innovatively decorated bustling cafe in the heart of Alsancak. A Boğaziçi University graduate who hails from Eskişehir, Murat was a mathematics teacher who traveled the world on his off time. He loved traveling so much that he deciphered a way to live in order to travel, which is also aptly the name of his travel show on İzTV, "Gezmek için Yaşamak" (Living to Travel). "This was entirely a teacher's mentality," Murat told me, explaining that if he helped jumpstart their travels, he knew that they would then read, go to museums, theatrical shows and other art and cultural events "because that's what you do when you travel." When Murat, who has been to more than 150 countries himself, wanted to travel more than a teacher's calendar allows, he devised a way to open a cafe that would be run by his fellow travelers when he was away traveling the world. Varuna Gezgin's first location opened in Eskişehir in 2004. Named Cafe Del Mundo, the name given to the restaurants run by Varuna Gezgin, Murat began a system of traveling with and training his staff, and in the dozen or so years since he started, he has sent 850 people on trips to different countries, many of which Turks do not need visas for. The cafes boast a menu of dishes from all over the world taught to his chefs in cooking courses in the countries of the dishes' origins. 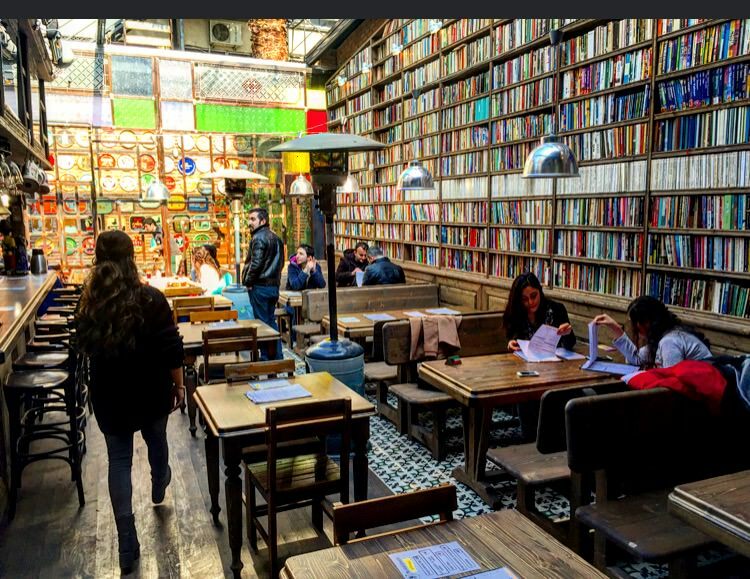 Each cafe has an extensive library with a wealthy collection of travel guides, and each are uniquely decorated with artifacts gathered by this traveler collective from all over the world. In 2010, Varuna Gezgin opened their first location in Ankara, two years later another followed in İzmir, and in 2014, a second cafe sprouted in the capital. Just five weeks ago, on Dec. 25, Varuna Gegin opened its first location in Istanbul, in Beyoğlu's Tünel neighborhood. Just three days later, the İzmir Lounge opened, which with a 350-person capacity, it also happens to be the biggest one yet. When I was there, there was a line outside the door, and I hear Istanbul is seeing quite the same demand. I was given a stool at their crowded square bar with a 360-degree view of the bustling young vibe and colorful eye-catching decor. I sat amid antique coffee grinders from all over the world. To the right was an entire wall composed of books, another was filled with jars of pickles and yet another with antique sewing machines while colorful signs in foreign languages from all over the globe filled all negative space. Every inch of the place acts as a living museum and was carefully thought out and inspired by Murat's travels. The Istanbul branch is no different, Murat assures, telling me about a priceless 500-piece toy collection from more than 100 different countries that dons the walls. "I wanted to do something different that nobody else was doing, so I started collecting antiques from all over the world," Murat said, explaining that once he knows they will be opening in a certain location, they then travel the world to go shopping for the beautiful antiques, signs, souvenirs and trinkets that will adorn it. Murat also conceives all of the interior decor and implements elements that have inspired him over the past decade of his backpacking career. He told me the library wall is an idea he got from a restaurant in Belgium, and the shape of the bar comes from the type he would see in Thailand. Professors from the Middle East Technical University Department of Architecture have even referred to his interior design ideas in their courses, he said, and he is not even an interior designer! The new Istanbul branch is equally impressive in its own right. Housed in one of Beyoğlu's oldest buildings, the Hidivyal Palace, which dates back to 1841, the interior even has Ottoman bricks in the walls, Murat said, adding that there is also a terrace with views of the Bosporus. In addition, possibly Turkey's most popular expat, the Dutch journalist, chef, photographer, travel show host and all around jack-of-all-trades, Wilco Van Herpen, is also co-manager of Istanbul's Cafe Del Mundo. Varuna Gezgin – in other words, Murat Fıçıcı's TV travel program "Gezmek için Yaşamak," airs on the documentary channel İzTV. 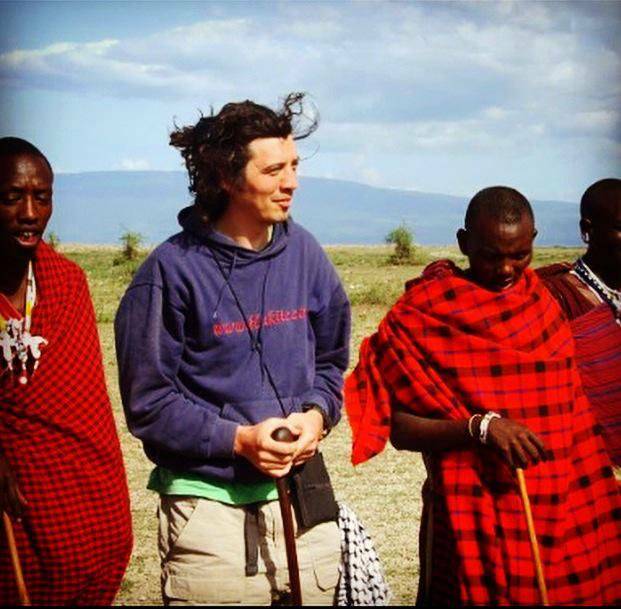 On the show, Murat takes his crew of travel companions – in other words his café staff – to destinations such as Ethiopia, Madagascar, the Philippines, Central and South America and even Papua New Guinea. Cafe del Mundo's menu alone, filled with dishes from all over the word, including pad Thai, tikka masala and the Japanese dish Tori Garage, is well worth trying out as all of the spices used in their making were brought straight from the source. This month, the Varuna Gezgin clan will also begin working on developing new, unique world cuisine menus for each branch. The cafes each have a wide array of international drinks as well as more than 120 types of beers, and have made the Bavarian glass one of their trademarks. Another Café Del Mundo classic is their weekly Quiz Night, held at each location every Sunday night at 9:45 p.m. Questions are read out in Turkish and English, and the winning prizes are a backpack, sleeping bag and a "Lonely Planet" travel guide. 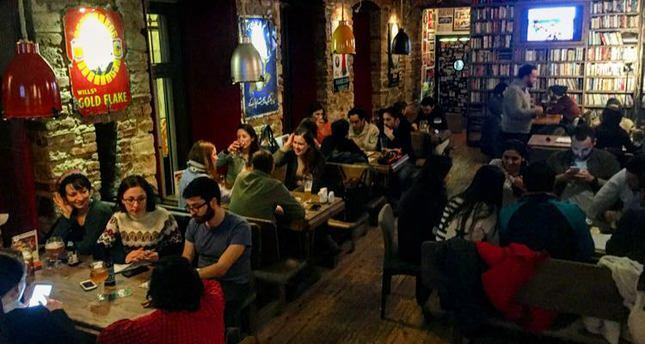 "The Lonely Planet" actually named the Eskişehir location as their Top Choice for 2013, but after my exhilarating experience in İzmir and with their new bumping spot in Istanbul, it seems the Varuna Gezgin legacy is just beginning its biggest journey. Add to that the Varuna Gezgin hostels in Taksim's Pera neighborhood and in İzmir, turning this one backpacker's dream into every traveler's paradise. Check out www.verunagezgin.com to find out more about their cafes and to read up on all of their extensive travel reviews and blogs.